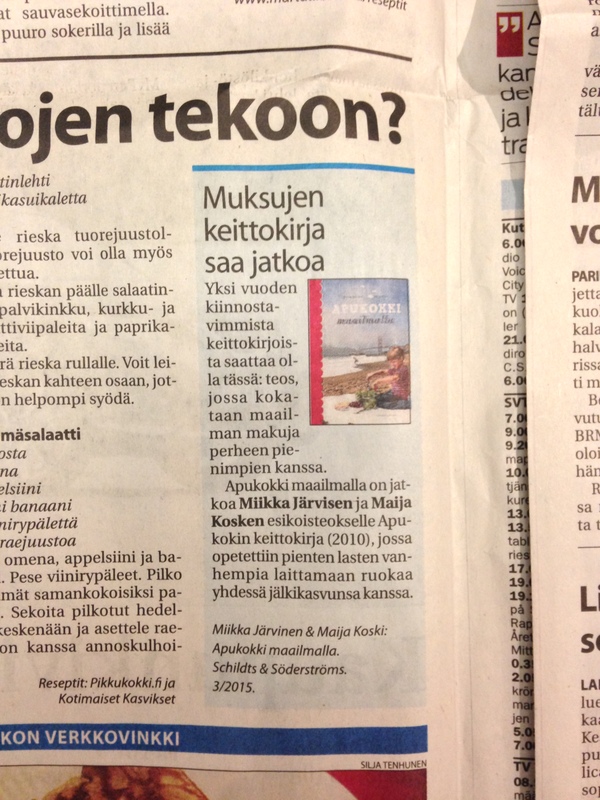 Magnificent book! 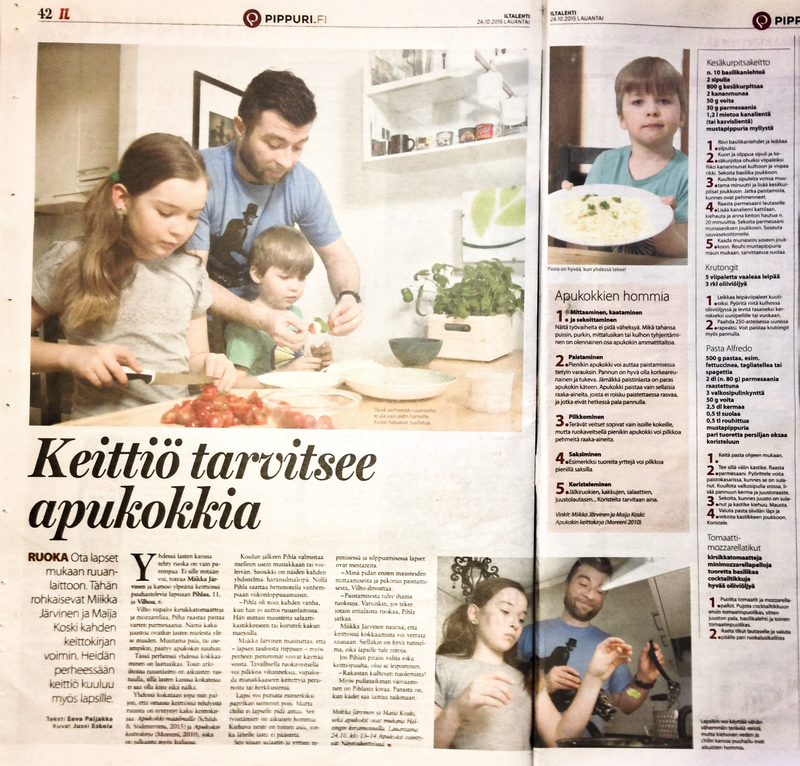 It explains very well, how to get kids cooking together with you. This would make a great schoolbook as well. If you have children or grandchildren, this is a book worth to get. This book is absolutely great! The recipes are good, food tastes both for picky eating kids and for demanding adults! Without the color-coded work stages in the recipes I wouldn’t never found all those tasks little chefs are able to do in the kitchen. Thanks for the magnificent book! Our kids have cooked with us since they were small. Pihla was about two when she first time came to the kitchen and wanted to help. I took a chair and placed it on the front of the stove. We continued with measuring and mixing the spices. It will result in good food and kids who eat better and are interested in food. New tastes are easier to get used to when they are served together with more familiar favorites. Take the kids with you to the kitchen! 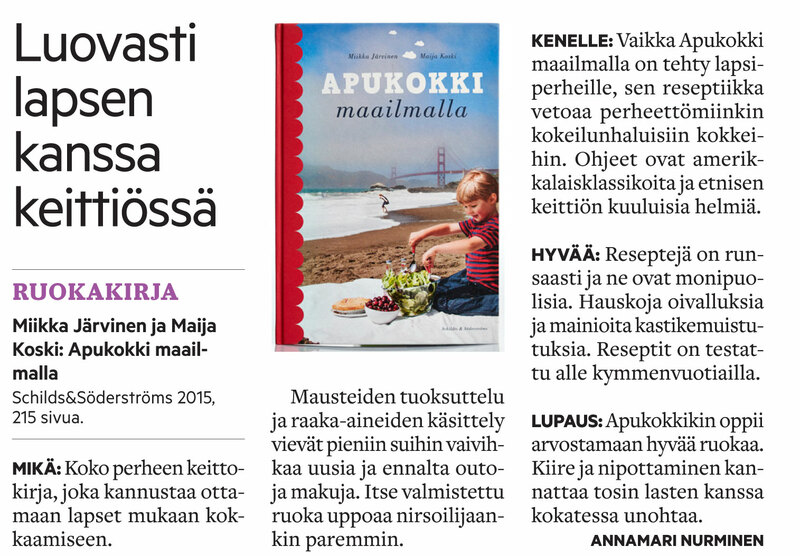 Miikka Järvinen’s and Maija Koski’s cookbook Apukokki maailmalla (Schildts & Söderströms) provides you international recipes for that. Even though the book is written for families with kids the recipes will work as well for single grown up chefs who love to try out new things. The recipes are a combination of American classics and famous ethnic delicacies. The central point of the book is San Francisco Bay, a melting pot of different food cultures. It’s focused on American kitchen accompanied by Mexican, Chinese and Italian delicacies. Every single recipe is tested together with kids, the Sous Chefs. Enjoy! Cook together in order to raise children who are interested in food, and eat with a good appetite. One of the most interesting cookbooks of the year might be this one: the book where you cook foods from around the World together with the smallest ones in the family. Also the filmstars fell in love to delicious Pasta Alfredo. Cooking together is quality time as it’s best. The food is just more delicious when done together with kids. Can’t help it. Along with the kids we’ve gotten new dimensions in our life, some kind of crazy curiosity. When the kids were small, we used to cook in our kitchen floor. It was just easier to decorate a cake there, for example, no matter for the mess.